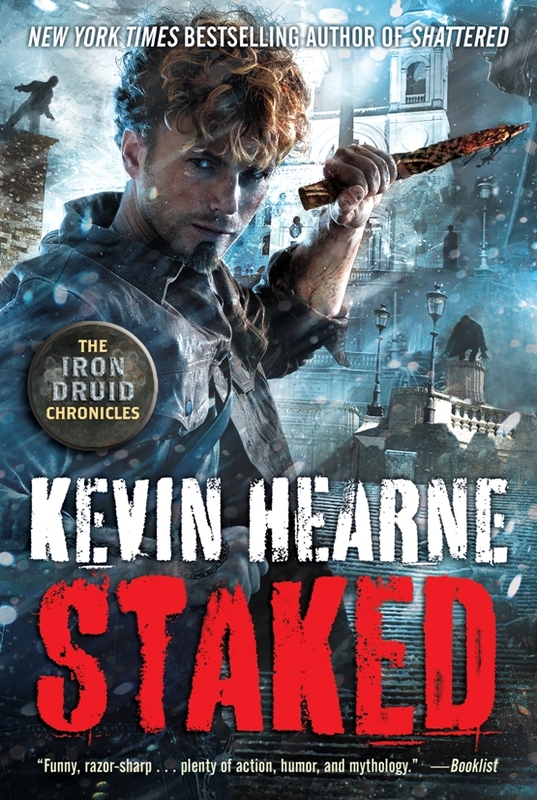 Staked is the penultimate novel in the Iron Druid Chronicles series, and being the eighth book in a nine book series, I think it’s deserving of such a fancy word. We are just one book away from seeing how this whole crazy saga ends. Will the druids defeat Loki? Can Atticus stop Ragnarök from happening? And what other crazy gods will seep out of the woodwork to make to make things a chaotic hell? While all those answers will have to wait, Staked keeps things fun and the tension high. Quite simply, this one is a vampire novel. The book starts with an author’s note warning readers that they may want to check the novella A Prelude to War before diving into Staked. If you’re inclined to do so, you’ll have to pick up the eBook Three Slices which is collection of three stories by Kevin Hearne, Delilah S. Dawson and Chuck Wendig. I opted to just dive into Staked, and while you do miss out on some things that are referenced in the book, you’ll be okay. Furthermore, if it’s been a while since you’ve read the previous books and you’re feeling rusty on where things are right now, there’s a handy catch-up chapter that summarizes everything that’s happened so far. It’s a very helpful refresher. Now for the story proper. In keeping with the vampire theme, the book starts with a bank heist in which Atticus goes after a book container all the addresses for the world’s vampires. It’s the first step in his quest to hunt down and kill the ancient vampire Theophilus. Elsewhere, Granuaile is on her own quest to rid herself of Loki’s mark so she can be free of his watchful eyes. This leads her to a witch’s coven in Poland and a journel to an island off the coast of Germany to find a warhorse of divination. Meanwhile Owen is off in Arizona starting up a grove to train new druids with the help of some werewolves. There’s battles with trolls, a giant cobra, armies of dwarves, and lots of vampires. With the help of some allies, the three druids go off on multiple adventures dealing with the gods and mystical creatures. It’s a fun romp around the world with lots of humor, action and some touristy tidbits of knowledge as they visit different places. Obviously this isn’t a book anyone would want to start with since it’s the eighth book in a nine book series. For fans who have been following along with the series, Staked is a must read. However the good news is that it’s another fun, enjoyable entry into the series. Whether you’re an Atticus fan, Granuaile fan or an Own fan, there’s something for everyone. Plus there’s lots of fun with Oberon and Orlaith and all their dog humor. Comparing Staked to the rest of the series, it’s a good entry, but I wouldn’t say it’s the best book yet. That said, it’s not a move in the wrong direction either. This one keeps up the action and plotting with tons of entertainment. While Atticus isn’t changing much as a character, Granuaile and Owen are. Plus this book brought me to tears at one point which is always a good sign that the author is doing their job right. The character depth is there. As a great read with entertaining characters, colorful action and enjoyable humor, I give Staked a five out of five metal bikinis. Kevin Hearne ended this one on a satisfying happy note and I’m interested to see how he’ll finish the series off with the end so close in sight.